Ride with Me: Bike Buying Guide! Best day ever?!! 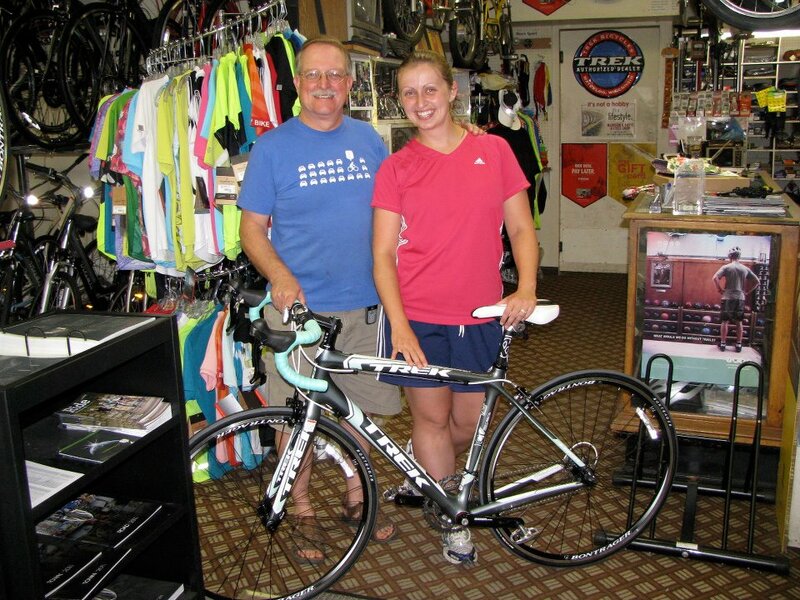 Greg Davis and I pose by my brand new Trek Madone! Buying a bike is a lot like buying shoes. Maybe you stroll past the clearance rack and you see a cute pair of pumps at 80% off and they’re not your size but they’re kinda close so you buy them. Then you wear them to the wedding reception and you’re miserable all night. By the time the DJ starts playing “Old Time Rock and Roll,” your “great buy” shoes are under the table and you’re wearing a hole in your pantyhose. And the shoes? They’re going straight to the back of your closet never to be seen again. Listen, I understand the temptation to look for a used bike or to go out to Walmart and buy something for $200. I really do. My first bike as an adult was bought second hand, but as it happens, I just got extremely lucky and could make it work for a while. When I bought it though, I didn’t know what a difference the right bike could make. It’s me and my bike again! 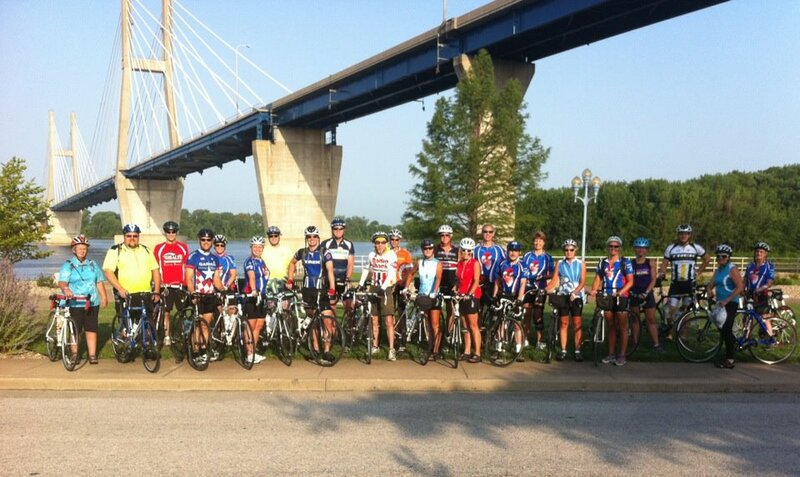 Notice the matching Bontrager jersey! The past couple of weeks, at least 4 different people have asked me to be on the lookout for used bikes for them. I’m not saying there might not be a decent used bike out there for all of you, but buying used is much harder than buying new if you really want to get lots of use out of your new bike. If you don’t want to banish your bike to the back of your garage like a pair of clearance shoes to the back of your closet, you’ve got to find a bike that fits YOU! Let’s put it in perspective. I rode my bike 2500 miles last year. If I average 15 mph, hat’s 166 hours in the saddle. 6.94 DAYS on my bike. Do you think I could have done that on a bike if it wasn’t super comfortable and built for me?!?! Even if you don’t plan on riding thousands of miles, it’s easy to see you’ll get more enjoyment and more use out of a bike that works with your body instead of against it. Your best bet is to go to a bike shop with knowledgeable people and learn about what type of bike you should buy. There are two shops here in Quincy. 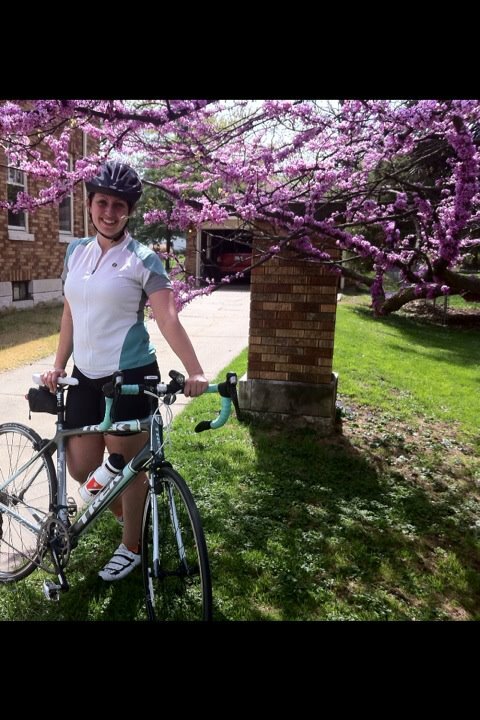 My personal endorsement goes to Madison Davis, a Trek retailer. Gamemasters also has a nice department though, and carries Specialized bikes. People can (and have) written whole books on choosing the right bike, but let me give you my two cent guide on what you need to do if you want to start riding road with me this year. Get measured. DO NOT just go a-Googling and find some height chart on the internet. Your friendly bike shop will measure you for free and will tell you what size you need. It’s worth noting that different brands measure bikes in different ways. For example, I ride a 52 cm Trek or a Medium Women’s Specialized. Think about your goals. 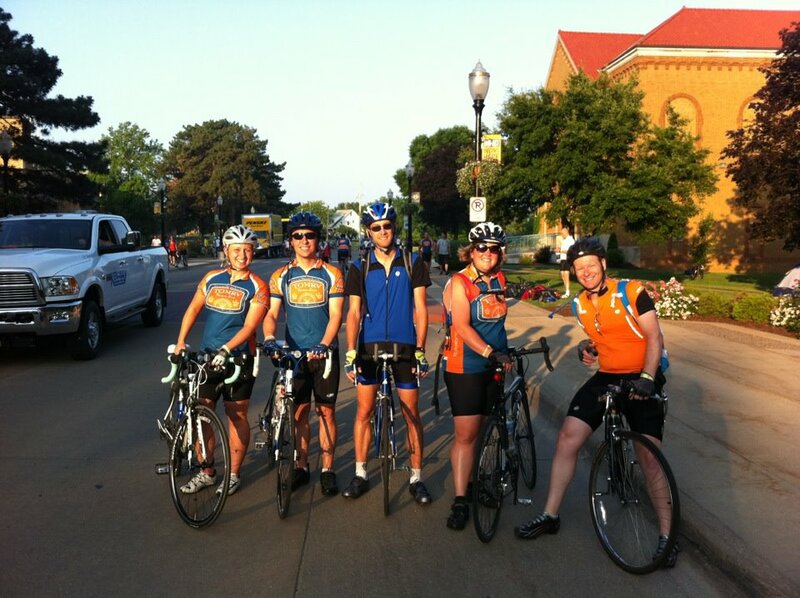 Are you going to ride some 10-20 mile routes or do you hope to work your way up to riding centuries (100 miles)? Do you want to be able to tow cargo and camp? Or do you want to race and try triathlons? If you’re just club riding and aren’t going super long distances, things like carbon seat posts (which reduce road noise) might not really be worth the extra cost for you. Buy the options you need! Think about your budget. Yes, I know. This is the least fun part. If my budget was unlimited, I’d buy a beautiful Trek Project One Domane and I would customize the paint job myself and have all the bells and whistles. But alas, my pocketbook has limits. Are you a lady??? In road bikes, the main differences in a women’s specific bike are the length of the top tube (from your seat post to your handle bars) and the angle at which you sit on the bike. There are very good graphics on the Trek website that illustrate this. The advantage to a women’s fit bike is that you won’t be reaching as far to the handle bars and therefore will put less strain on your back and shoulders. If you’ve got a nice long torso, this might not be an issue for you, but for me, the women’s fit really feels nice. The disadvantages of women’s design are that the women’s bike geometry isn’t as aggressive (which is important to racers) and they tend to feature pastel colors or flower graphics. The girly color/graphic package is a whole other rant though. Don’t fear the saddle! I’ve seen it before. People take one look at those skinny, rock hard saddles on road bikes and demand that it’s switched out to something with gel in it. Don’t do it, my friend! I should probably write a whole other blog post about saddles, but the short story is: they can be measured too. You sit your cute little bottom on a piece of foam, the foam measures your sit bones, and then you get the right size saddle for you. Let the bike shop show you how to position your saddle for maximum comfort and in just a few rides, you’ll like a road bike saddle too. Understand your bike and what it’s made of. I suggest this blog post which I wrote last year on the subject! I never get tired of bike pictures. In conclusion- even if you don’t buy a new bike, start your research by looking at new bikes. 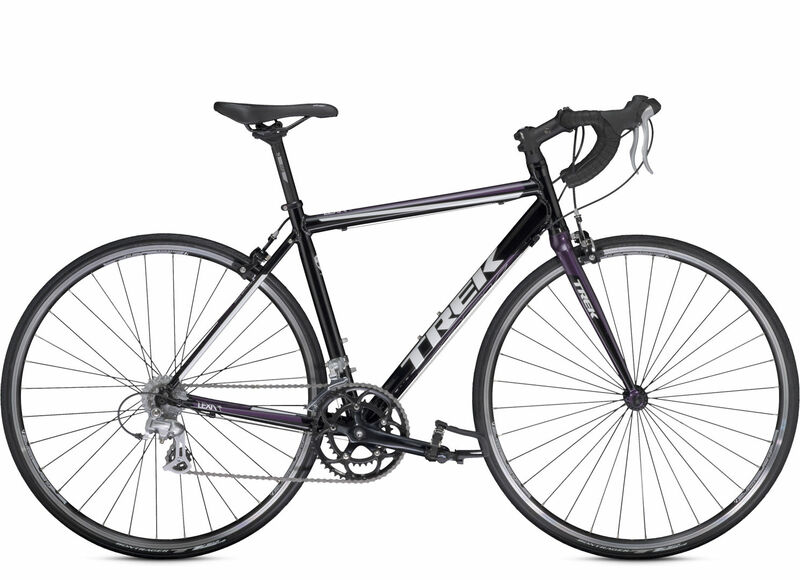 If you know what you want is a Trek 1.2 in 54 cm, you can go look for that bike. Then you can do your comparison pricing and see if it’s worthwhile to buy used. It’s an entry level carbon bike. Carbon is a tough material and it’s good at reducing road noise. It’s lighter than aluminum and since I knew I’d be a long distance rider, I thought carbon was the right choice for me. I almost bought a Lexa, which is an aluminum bike with carbon seat posts and forks. I probably would have been happy on this bike too (and would have saved some money) but I knew I loved to cycle by this point because I had already put over 1000 miles on a steel bike. So, I decided I wanted to get the best I could afford so that I wouldn’t want to upgrade in just a few years. I wanted something that could grow with me. My bike has 105 Shimano shifters/derauillers etc. That’s the middle of the Shimano line. I don’t feel like I’m a biker who has to count every little ounce yet, so I didn’t want to upgrade to the Ultegra or Dura-Ace level sets, which are extremely light weight but also very pricey. I’ve got a short torso, so Women’s Specific Design was the right choice for me. It’s plenty aggressive for the type of riding I do. The base price of the bike I picked is right around $2000. After adding pedals, shoes, a helmet, computer, etc, it was more of course, but I didn’t purchase all of the accessories all at once. It’s worth it in the long run! Trek and Specialized (and other major brands) often offer financing on bikes, and I took advantage of that. I believe I had zero interest for 12 months or something. It was a great deal. Most importantly: I have never regretted a dime I spent on buying the right bike. I love The Dream Machine! This is the 2013 Lexa. It’s a nice bike! So, there you have it. Buy a bike! Come ride with me!! I PROMISE cycling will make you smile.